The Most Stunning Bridal Entries Of 2017 - #Weddingz2017Rewind! A bride’s entry is the most anticipated moment at a wedding. Everyone is just waiting to catch a glimpse of the bride in all her finery - her wedding attire, hair and makeup and her complete bridal look! With the entry being one of the most sought-after parts of a wedding, it’s only natural for brides to get more and more creative. 2017 as you know has seen some of the most elaborate weddings and the bridal entries were more stunning than ever too! Walking on ‘Din Shagna Da’ towards Virat Kohli to take her wedding vows, Anushka Sharma (literally) broke the internet with her bridal entry. How about getting a tad more creative and asking your bhai to hold a beautifully decorated umbrella? We are loving how these brides have swapped the phoolon ki chaadar for the phoolon ka umbrella turning heads all the way! Game of Thrones has certainly taught its fans to be wary of weddings, but seems like this couple loved the show a bit too much! Inspired by this popular series, this bride created a whimsical, non-bloody Game of Thrones themed décor for her bridal entry and it was stunning! #WeddingDecorGoals! Now that’s a dramatic entry for a queen! For a stunning bridal entry such as this, all you need is a chariot and some sparklers attached to it! 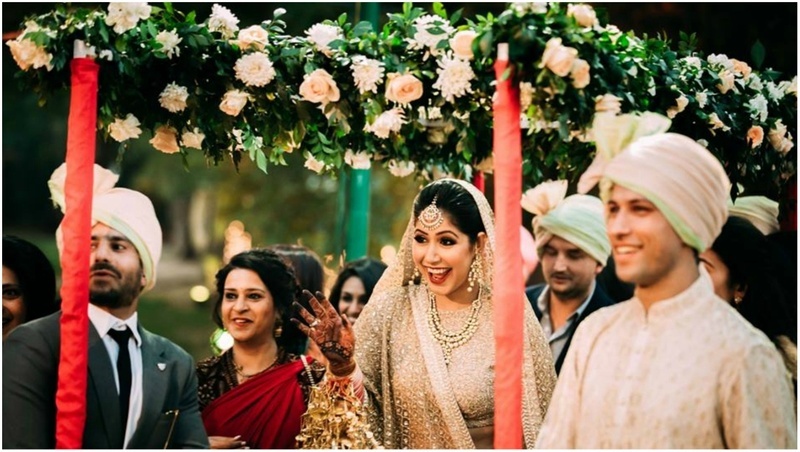 If phoolon ki chaadar is not your style then you can enter your wedding with your bridesmaids showering flower petals on you while you walk towards your mandap! Ride in with your brother on a motorcycle decorated to fit your Big Fat Indian Shaadi. Now that’s an entrance like no other! Ride in on your favourite bike/scooty with your dog BFF turning heads all the way! Want to shoot up the cuteness factor? We suggest twinning outfits! There ain’t no entry can match the emotional factor of your parents walking beside you! Best part - it’ll be etched in your memory forever! This sure is one of the quirkiest bridal entries we have ever spotted. Works well mostly if you're having an outdoor day wedding, but it looks so damn cool! This one’s a classic and will never go out of style. The chadar though, seems to have gotten more advanced with every passing year and we are loving the variations here. We suggest have a word with your florist and let your imaginations run wild. No she was not entering the mandap like that, but her makeup room. We just, couldn’t help ourselves from including this bride’s entry to this list *guilty as charged*. With our list of 13 best bridal entries coming to an end, we hope you too must have found enough inspiration to make a stellar bridal entry for your wedding!